The City of Fort Wayne Redevelopment Commision is issuing a request for qualifications (RFQ) for teams interested in developing the premier riverfront property located at the northeast corner of Harrison and Superior streets, east of Promenade Park. The City of Fort Wayne Public Art Commission and Arts United are inviting all residents to a PechaKucha event designed to explore various forms of public art. The event is scheduled for Tuesday, March 26 from 5:30 to 8:00 p.m. at the Arts United Center/Rolland Gallery, 303 E. Main St. The Office of Housing and Neighborhood Services Homeowner Repair Loan Program is now open to qualified residents. The program offers 0% interest seven-year loans for heating, air conditioning or roof replacement. Applicants must own their home, it must be their primary residence and the home must be located within City limits. Applicants must also have a household income at or below 80 percent of the Area Median Income, or approximately $52,000 for a family of four. 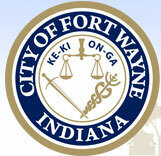 The planning process for the next phases of Riverfront Fort Wayne is halfway complete and residents are invited to learn about the progress during a public meeting set for Thursday, March 7, 2019. The meeting will take place from 6:30 to 8 p.m. in the North Side High School auditorium, 475 E. State Blvd. Residents should enter through Door #1. Light snacks will be provided.